I thought I would post another letter before the year ended…but obviously I didn’t. Winter break is over (insert sadface), but it was a good three weeks. I spent the first week plus some at work, a couple more days at a church retreat, and the remaining days with my family and friends. It’s always a joy to be at home, and it makes me happy to see old faces back home for the holidays. 2014 is here, 2013 is gone (*whispers* foreverrrr. If anyone got that Friends reference…you make me proud), and winter quarter is here! I’m not going to go into too much detail, but 2013 was a good year. A bunch of trials and struggles, but I know that God is sovereign and has planned all things for a greater purpose. Something that comes with each new year is new year resolutions. I used to make resolutions, but stopped once I failed to keep up with them. As for this year…I’m not sure. I haven’t really sat down to think about my resolutions, but I do know one of them is be more consistent with my blog posts (sorry all!!). One for sure resolution is to glorify God in all that I do. And only through the grace of God may I do so. One more thing before I get to the donuts (or doughnuts? what? ): The Resolutions of Jonathan Edwards. Read it. It’s an encouragement. I’m reading it too. 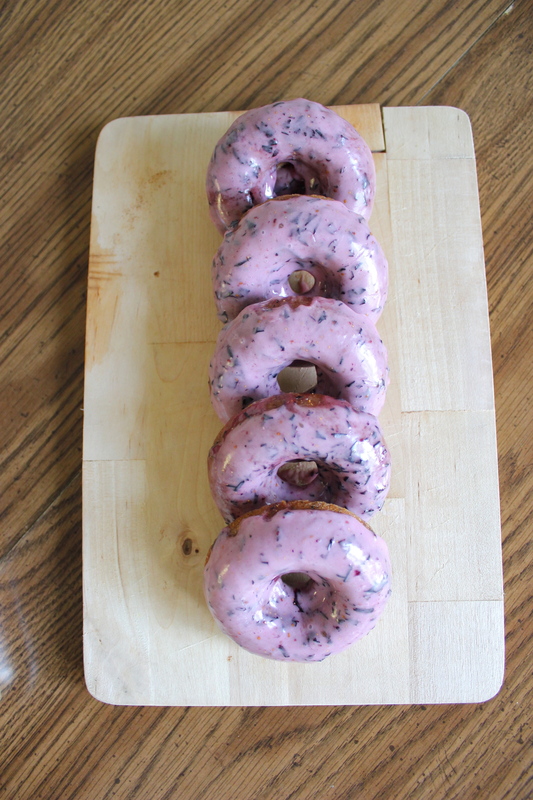 E is for earl grey (baked) donuts with a blueberry glaze. I had originally planned to do earl grey macarons for the letter E, but that one totally flopped. I tried a new recipe and the shells just looked like junk. I did tint it a pretty blueish/gray color though! But the shells didn’t come out right, and the filling was too runny. I’ll try them again eventually! You’ll find out when I do. But I finally caved and bought donut pans–they’re so cute! I love donuts, but I hate dealing with all the oil after you fry them, so I figured baking them would be the way to go. BUT DISCLAIMER: if you’re thinking baked donuts=yeasty, bready donuts, then you’re wrong, and this recipe may not be the right one for you. 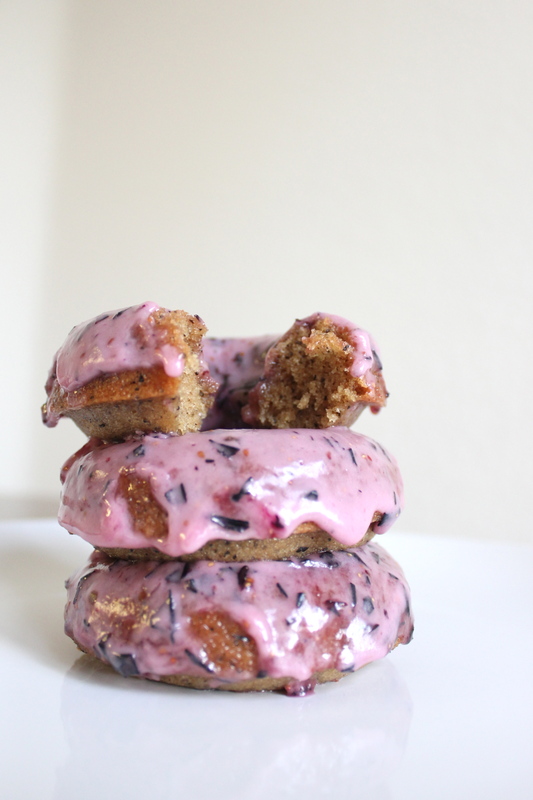 Baked donuts taste more like muffins instead of bread, but having them in a donut shape do make them much more fun. 1. Preheat the oven to 350°F. 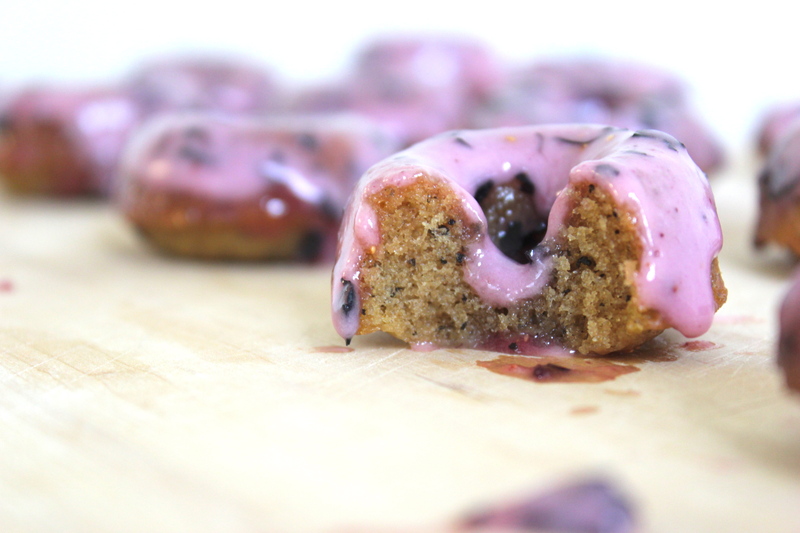 Prepare your donut pans by spraying with cooking spray. 2. 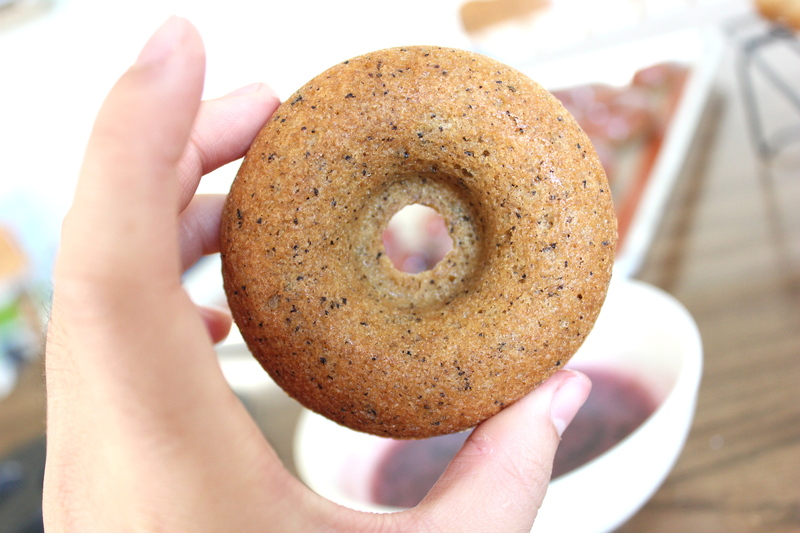 For the donuts: Open one tea bag, and pour out the leaves into a small bowl. Using a spoon (or a mortar and pestle if you have it), crush up the big tea leaves by pushing the tea leaves against the sides of the bowl with the spoon. It’s okay if you can’t get it. I just wanted didn’t want big leaves in the donuts. 3. Steep the other tea bag in the hot milk for 5 minutes. Using a fork, poke at the bag to get as much flavor out of the leaves. It’s okay if you pop the bag because the leaves will just get mixed into the donut dough. Toss the tea bag. 4. In a medium bowl, combine all the dry ingredients (first five listed above). In another bowl, combine all the wet ingredients (the last five listed above, including the steeped milk–make sure it’s not too hot or it’ll cook the eggs). 5. Pour the wet ingredients into the dry ingredients, and stir just until combined. 6. Fill the prepared donut pans 2/3 full with batter (don’t fill too much, or else they’ll come out looking like mini bundt cakes). You can spoon in the batter, but I poured the batter into a pastry bag and piped the batter into the pans for better control. Bake them for 10-13 minutes, until a toothpick inserted comes out clean. 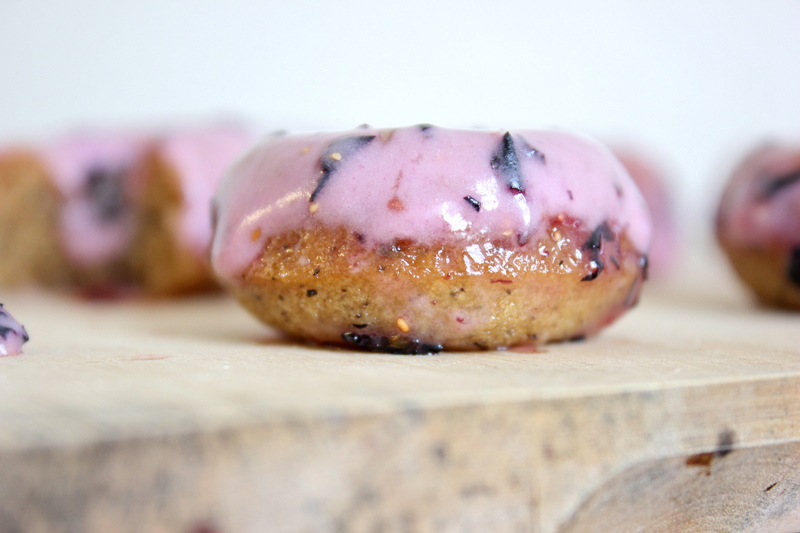 If you’re making mini donuts, bake them for 8-10 minutes. Let the donuts cool before dipping them in the glaze. 7. 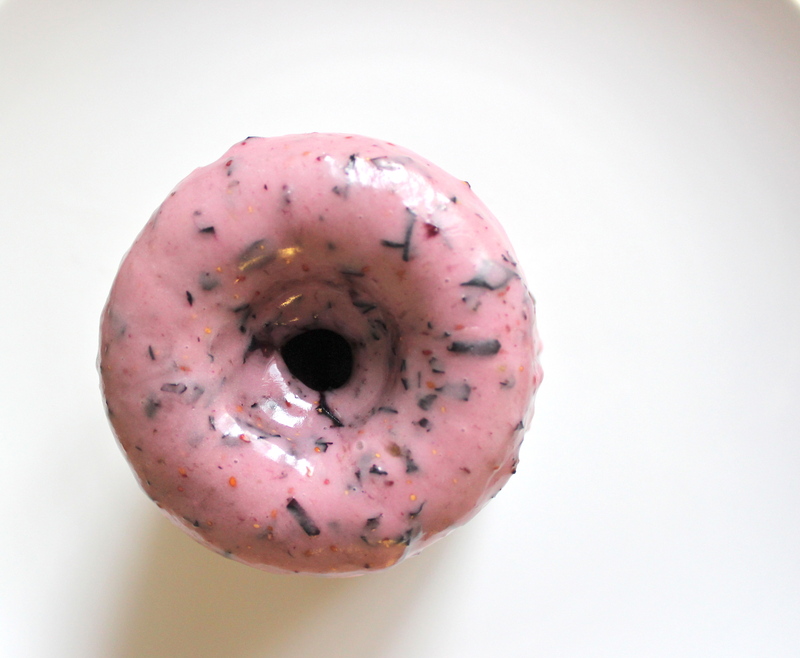 For the blueberry glaze: Place blueberries, powdered sugar, and lemon juice in a food processor, and pulse until smooth. 8. 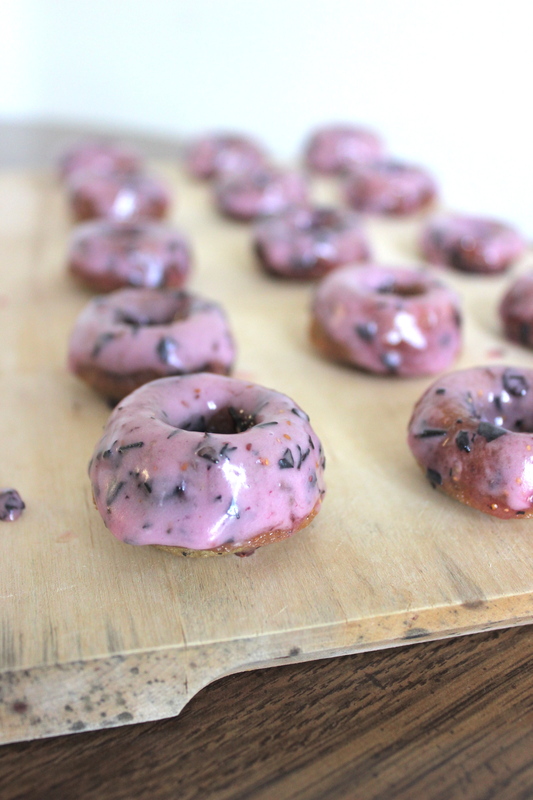 Dip the cooled donuts in the glaze, and let them set before serving. Enjoy! 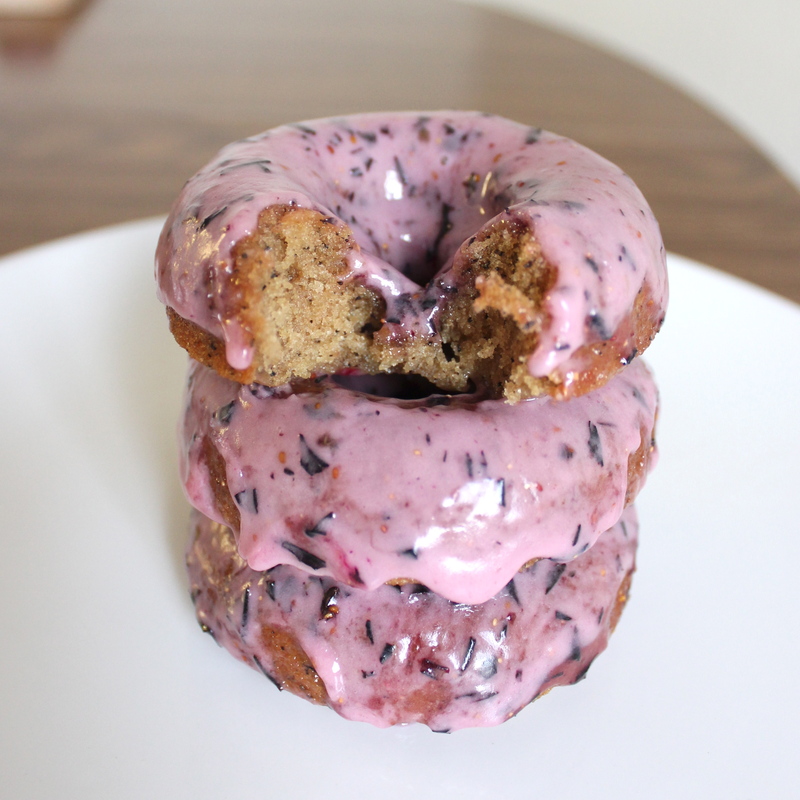 This entry was posted in Baking Through the Alphabet, Desserts and tagged baked donuts, blueberries, blueberry glaze, dessert, donuts, earl grey, earl grey donuts. Bookmark the permalink. 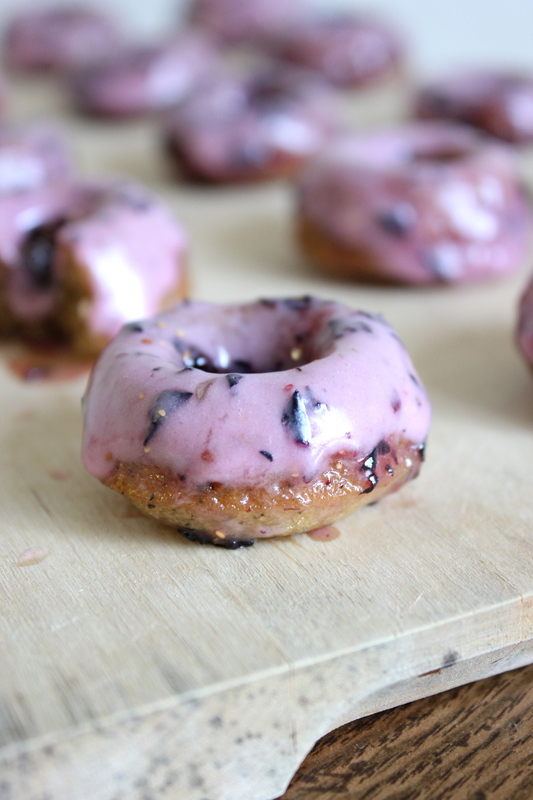 YES they look exactly like the donuts from the Simpsons! And hooray for the Friends reference! Jess and I watched episode one last night LOL. I’m trying to decide what I like best, the title of this recipe, how easy you make these look, or the fast that you have a Biblical quote right at the top of the page. It all looks fantastic. Great looking recipe. Going to make these without a doubt. Thanks so much!! :) And I hope you enjoy them as much as I did!